Video tapes and film rolls are subject to natural wearout just like any other analog picture or sound material (slides, negatives, records, music cassettes). Over the years the image and sound quality considerably decreases even without playing it only once. 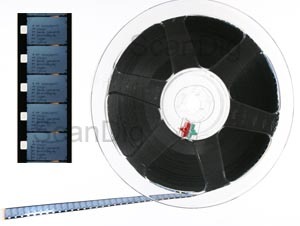 You can find numerous video tapes and film rolls with partly precious private memories like the first holidays together, the wedding, the child's or grandchild's first attempts at walking, the long ago company anniversary or a funny christmas party from the last century lingering in lots of archives. These old video tapes and film rolls often even can not be watched anymore, because DVD and hard disk recorders squeezed the over decades approved VCR out of the market, and modern camcorders and beamers have replaced old film cameras and projectors. 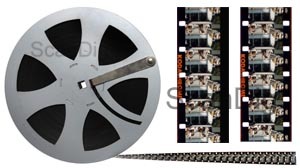 We offer you inexpensive and professional digitalisation of your video tapes. Videos which once are available in digital form do not age any longer, can be digitally archived and converted into future media. Just send us your video tapes or film rolls together with an order for digitalisation, and you will retrieve your precious recordings on DVD, USB stick or external hard drive. For our services there are legal warranty rights. We will destroy film material, you have sent to us, or data media, we have provided for you, after one year, if you don't pay our invoice within one year or if we don't have a valid address for the return shipment. You will get your videos either on DVDs, USB stick or on an external hard drive. DVDs, USB sticks and hard drives have an average expectation of live of many years, however, they can also break after a short time or loose their data. Therefore it is necessary by all means that you check the data and make an additional backup immediately after receiving the storage media; we delete your data after approx. 4 weeks irrevocably. We, the company ScanDig, are a renowned company in the range of photo and video digitalisation. Since the year 2000 our team digitised precious image material for tens of thousands of customers (see our reference list). The protection of your privacy and your data is a matter of course to us, i.e. your videos are not given to third parties. Videos saved on hard disk are being irrevocably deleted few weeks after payment of the invoice. We employ only qualified personnel, for example photographers, digital media designers, illustrators who have detailed knowledge in the range of digitalisation and handling of film material of any kind, and are bound to careful and discrete handling of our customer's material as well as nondisclosure of cusomer's data by contract. By signing the order form you assure us of you being the owner of the sent in videos and you do not breach any copyright. We do not digitise video tapes with pornographic contents or contents gloryfying violence. 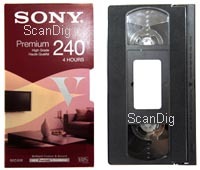 We digitise your VHS tapes, S-VHS tapes, VHS-C tapes and S-VHS-C tapes of any length. Just send us your video tapes together with a completed order form. We make a separate DVD of each video tape. If you desire one or more backup copies please inscribe into the field comments. The tapes may be recorded eather in the European PAL-format or in the American NTSC-format or in the French SECAM-format (S-VHS and S-VHS-C not available in SECAM-format). If you send us tapes in the NTSC-format or SECAM-format, please, not this on the order form. We offer 3 different video formats: Video-DVD, MPEG2 and AVI. A Video-DVD can be played with your DVD player just like a normal bought DVD, so that you can watch the Video-DVD on your television screen. If you want to watch your videos on your PC we recommend the MPEG2-format. Videos in the MPEG2-format are highly compressed, so that 90 minutes film can be stored on a DVD. If you want to edit or cut your videos after our digitalization we recommend the AVI-format. Videos in the AVI-format are only slightly compressed and therefore in best quality. One hour of video in the AVI-format takes about 13 GB hard disk space. We store your videos either on DVD+R, on USB sticks or on external USB hard drives. If you whish to receive your videos on DVD-R, please, mention this in the field Notes on the order form. We store maximally 2 hours video on one DVD. If the cassettes are labelled we copy the label (or a part of it) into the file name. If the tapes are unlabelled we assign general titels like Film_01. If you would like to specify the title individually, e.g. Wedding 1980, please fix a suitable label on the tape or fill out the form Title list. By default we digitise each video tape completely, i.e. from the beginning of the tape to the end of tape. Please, note that we can not process defective video tapes. We exclusively use high-quality video players for our video digitalisation. Anyway we overtake no liability for damages for example by tape jam or defective video tape cassettes. Please inform us if you have added a soundtrack to your video tapes later so that we can find the additional soundtrack. For your order, please, choose on our site Order Form the order form for video tapes. We digitise your Hi8 tapes, Video8 or Digital8 tapes of any length. Just send us your tapes together with a completed order form. We make a separate DVD of each video tape. If you desire one or more backup copies please inscribe into the field comments. The tapes may be recorded eather in the european PAL-format or in the american NTSC-format, however, not in the french SECAM-format. 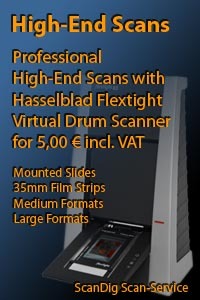 We digitze your MiniDV-tapes of any length. Normal Mini-DV tapes have a length of 60 or 80 minutes in the standard play mode (corresponding 90 or 120 minutes in the long play mode). MiniDV-tapes are usually stored in a plastic case of the size 70 x 50 x 15 mm and have a label MiniDV on it. MiniDV tapes are a modification of DV-tapes, which have approximately double dimensions. The digital video format (DV-format) was introduced in the year 1994 and displaced the standard video format. As one can derive from the name, it is a digital storage format, where the singular pictures are compressed similar to the JPEG-procedure. The data stream of the digital MiniDV-format is 25 mega bit per seconds, i.e. 187.5 mega bytes per minute. This yields a file size of approx. 11 giga byte for a 60 minute tape, and about 15 GB for a 80 minute tape. We digitize your Super8 films with professional studio equipment. There are Super 8 films in compact cartridges with a length of 50 ft, i.e. about 15,25m. On a 15m tape there are about 3600 singular pictures so that one gets a running time of 3:20 minutes with the usual picture frequency of 18 frames/second. With the higher frequency of 24 pictures/second the running time is 2:30 minutes. We process Super 8 films both with 18 and with 24 frames per second. The frame rate will be detected automatically during the digitalization process. You can send us Super8 films both on classic 15m rolls and on larger film rolls. Please, send us your Super 8 film rolls together with a filled out order form. If you whish best possible image quality we recommend the optional image optimization Manual coulour and brightness correction. Then the colour and light intensity of each video scene will be manually corrected and optimized both during and after the digitalization with the help of a professional video processing software. Optionally we offer a professional film cleaning. With this the film will be wet cleaned with a specific film cleaning fluid and dried afterwards. By cleaning the film before the digitalization one achieves a much better image quality, since dust and dirt will be removed effectively. We recommend the additional film cleaning especially if your film rolls have not been played-back for years or even decades. Please, note, that we can digitize Super 8 films only if they are in a good state. If adhesive joints are not ok or even break we renew them for a surcharge. In order to insert the film roll we need about 5 seconds empty film material at the beginning and at the end of a film roll. If your film roll does not have this space, about 5 seconds will be cut off at the beginning and at the end. For each film roll you send us we charge a basic fee for the initialization and rewinding; the digitalization will be billed by minutes. Please, note, that we cannot digitize negative films, i.e. only reversal films and positive films. However, negative films are extremely rare in the film area. If there is a magnetic sound track it will be digitized, too; optical sound tracks cannot be digitized. If there are 2 sound tracks they will be digitized with identical loudness. If you whish the automatic reduction of the volume of one sound track, please give us that note in the comment field of the order form. Please, use the identifier track 2 for the sound track on the perforation side and track 1 for the sound track on the opposite side. Without these detailed denotations an automatic reduction of a sound track cannot be made. The reduction of the volume of a sound track cannot be made afterwards. If the film rolls are labelled we copy the label (or a part of it) into the file name. If the film rolls are unlabelled we assign general titels like Film_01. If you would like to specify the title individually, e.g. Wedding 1980, please fix a suitable label on the film roll or fill out the form Title list. For your order, please, choose on our site Order Form the order form for film rolls. The normal 8 film, also called regular-8 film, is an advancement or a modification of the 16mm film, which was very common in the field of television production. If a 16mm film roll was first exposed on its left half and then on its right half, one obtained an 8mm film roll of double length by cutting the 16mm film roll in the middle. Films which were produced with this cutting procedure are also called Double-8 films. Of course there are also Normal-8 (Regular 8) films, which were produced without cutting a 16mm film roll into halves. 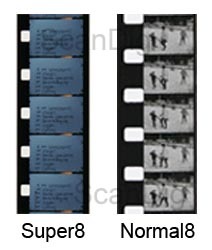 Normal8 films differ from Super 8 films in the image format and the perforation holes. A Normal8 (regular 8) image has the dimensions 4,7 x 3,6 mm, and is so significantly smaller than a Super 8 image with the approximate dimensions 5,5 x 4,1 mm. On Normal 8 films the perforation hole take less space than on Super-8 films. On Normal 8 (regular 8) films the wide perforation holes are located in the area between two pictures; on super 8 films the perforation holes are in the middle of an image. We digitize your Normal-8 films with first-class equipment. We can process films both with 18 and with 24 pictures per second. The image frequency will be detected automatically during the digitization process. You can send us your Normal-8 (Regular-8) films on classic 7,5m / 15m rolls or on larger film rolls. Please, include a filled out order form in your shipment. Please, note, that we can digitize Normal 8 films only if they are in a good state. If adhesive joints are not ok or even break we renew them for a surcharge. In order to insert the film roll we need about 5 seconds empty film material at the beginning and at the end of a film roll. If your film roll does not have this space, about 5 seconds will be cut off at the beginning and at the end. For each film roll you send us we charge a basic fee for the initialization and rewinding; the digitalization will be billed by minutes. Please, note, that we cannot digitize negative films, i.e. only reversal films and positive films. However, negative films are extremely rare in the film area. Normal-8 films are usually silent films. If there is a sound track on the Normal-8 film it cannot be digitized. 16mm films have by definition a width of 16mm. The 16mm is a substandard format film which was mainly used in the field of television. Whilst in the cinema area the 35mm film was standard, in the television world the 16mm film format was standard for almost half a century, until digital formats displaced classical film rolls gradually. The advantage of 16mm films compared to the 35mm cinema film was, that more compact cameras could be built and used. The image dimension of a 16mm film is 10,3 x 7,5 mm. The perforation holes are in the area of the frame line, i.e. between two images. 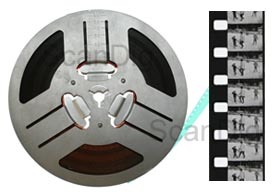 There are 16mm films with either single-sided or with double-sided perforation (see picture). On a single-sided perforated film there can be a sound track at the place of the missing second perforation. Taking the image height of 7,5mm and the small space between the images one comes to a number of 130 images per meter on a 16mm film. Consequently, on a classical 120m film roll there are 15600 frames. When projecting such a film with 18 frames per second a 120m film roll runs about 14,5 minutes, with a frame rate of 24 only 11 minutes. Special case Double-8 film on 16mm film: From double-sided perforated 16mm films one could create so-called double-8 films by exposing first the left half and then the right half of the film. On such Double-8 films there are 2 films on a 16mm film roll side by side. In order to digitize such a film it has to be cut first in its middle. The cut is done with a specific 16mm cutter. After cutting the 16mm film the new 2 Normal-8 films have to be winded on a new film spool and can be digitized as Normal-8 films. We digitize your 16mm films with first-class equipment. We can process films both with 18 and with 24 pictures per second. The image frequency will be detected automatically during the digitization process. 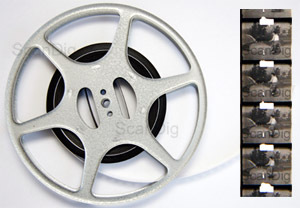 You can send us your 16mm films on small 30m rolls or on larger film rolls. Please, include a filled out order form in your shipment. Please, note, that we can digitize 16mm films only if they are in a good state. If adhesive joints are not ok or even break we renew them for a surcharge. In order to insert the film roll we need about 5 seconds empty film material at the beginning and at the end of a film roll. If your film roll does not have this space, about 5 seconds will be cut off at the beginning and at the end. For each film roll you send us we charge a basic fee for the initialization and rewinding; the digitalization will be billed by minutes. Please, note, that we cannot digitize negative films, i.e. only reversal films and positive films. However, negative films are extremely rare in the film area. 16mm films are usually silent films. If there is a sound track at the place of the second perforation it can be digitized, if you mention this on the order form. There are 9,5mm Pathé-films since the 1920s; they were created by cutting 28,5mm wide Pathé-Koko-films into thirds; that's why the film width has the unusual dimension of 9,5mm. Pathé films can be recognized easily at the perforation in the middle. So the perforation holes, which serve for the film transportation, are not located on the film edge like on the most films but centrally in the middle of the film. The adnvantage of the middle perforation is that the complete film width can be used for the images. We can process Pathé-films both on smallest film rolls and on large film rolls. Please, send us your Pathé film rolls together with a filled-out order form. Please, note, that we can digitize Pathé films only if they are in a good state. If adhesive joints are not ok or even break we renew them for a surcharge. In order to insert the film roll we need about 5 seconds empty film material at the beginning and at the end of a film roll. If your film roll does not have this space, about 5 seconds will be cut off at the beginning and at the end. For each film roll you send us we charge a basic fee for the initialization and rewinding; the digitalization will be billed by minutes. Please, note, that we cannot digitize negative films, i.e. only reversal films and positive films. However, negative films are extremely rare in the film area. Pathé films are usually silent films. Sound tracks cannot be digitized. We send burned data CDs and DVDs as normal letters to you; film- and video material as well as USB sticks and USB hard disks we send only as DPD-parcels with 500 € insurance. The prices for the digitalization are the same for national and international customers, however, the shipment costs are different from country to country. Customers from EU-countries with a valid value added tax identification number and customers from Non EU countries (Swizzerland, Liechtenstein) will be supplied without German value added tax. We politely ask customers from Non European Community countries to get in touch with us before sending film material to us, so that we can inform you about the customs modalities. Please, note, that we do not offer a value added tax refund subsequently if you pick up your film material and your data medium in our office and export it by yourself. 1) In the price there is included the data transfer from the used scan stations, the data check, the final check and a new USB stick or USB hard drive.